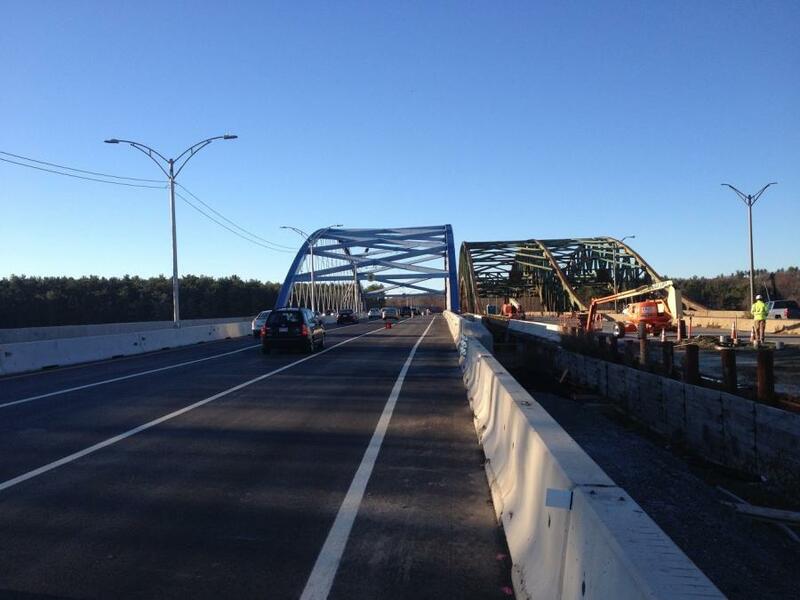 The five-year Massachusetts Department of Transportation (MassDOT) Whittier Bridge/I-95 Improvement project is now in its final six months. 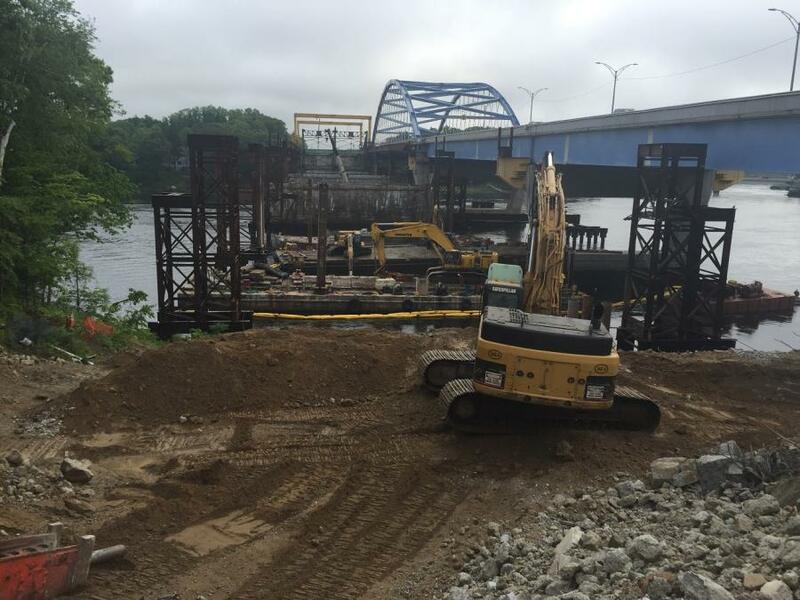 With the construction of the new Whittier Bridge complete, crews are removing the old bridge's foundations from the Merrimack River and paving the new lanes on I-95 within the project corridor. The Whittier Bridge, which was built in 1951, was deemed no longer meeting current safety standards, and with I-95 being a primary transportation route through the area — in 2007, 52,275 vehicles crossed the bridge, and in 2030, the anticipated volume is 61,790 — it needed replaced. The final $317-million-dollar project called for constructing a new Whittier Bridge with four lanes of traffic in both the northbound and southbound directions. And because the new bridge would be expanded to have four lanes, the 3.5-mi. stretch of I-95 between exit 57 and exit 59 also had to be widened and four bridges replaced to accommodate the additional lanes of traffic. The joint venture of Walsh-McCourt JV1 was awarded the contract and started construction in summer 2013; Chicago-based Walsh Construction Company constructed the Whittier Bridge and Boston-based McCourt Construction took the lead on the roadway and the other bridges. Chris Daigle, of Walsh-McCourt Joint Venture, said that both companies have experience constructing similar projects. Construction of the new Whittier Bridge started with the in-water foundation work and the abutments for the northbound span. With the Merrimack River's channels remaining open throughout the entire period of the in-water work, which lasted nearly a year from September 2013 through July 2014, the project team had to coordinate with the U.S. Coast Guard and boaters to keep the channels open. “The most challenging part of the water work was the combination of currents, tidal fluctuations and shallow water in some areas,” Daigle explained. The river conditions required the use of a gantry system to construct the bridge's superstructure, which was done from north to south. Daigle said that steel pipe piles were drilled into the bedrock and temporary towers were built on top of them. The steel box beam supporting the gantry was 6 ft. high and 4 ft. wide with a running length of 750 ft. (228.6 m). This system enables crews to construct the bridge arch span and north approach spans together, followed by the southern approach spans. Following the construction of the new northbound span, the existing Whittier Bridge's northbound and southbound traffic was shifted onto the new span. Crews began demolishing the old Whittier Bridge in December 2015 and finished in June 2016. Its steel, and concrete bridge deck and substructure, were recycled, while the granite blocks used in the substructure were salvaged and reused. For the rest of 2016 through fall 2017, crews constructed the new southbound bridge. Almost 600 precast panels were used to construct the approximately 200,000 sq. ft. of bridge deck, Daigle said. Approximately 21,000 cu. yd. of cast-in-place concrete was used. Because of the project's complexity, nearly 20 crews were on site throughout the project corridor and worked days, nights, and weekends to finish the project. On Dec. 8, 2017, the southbound traffic was rerouted from the northbound bridge onto the southbound bridge. “For the most part, we have been able to maintain three lanes of traffic in each direction throughout the duration of the project,” Monroe said, adding that there were no significant traffic restrictions or traffic congestion during peak travel hours. 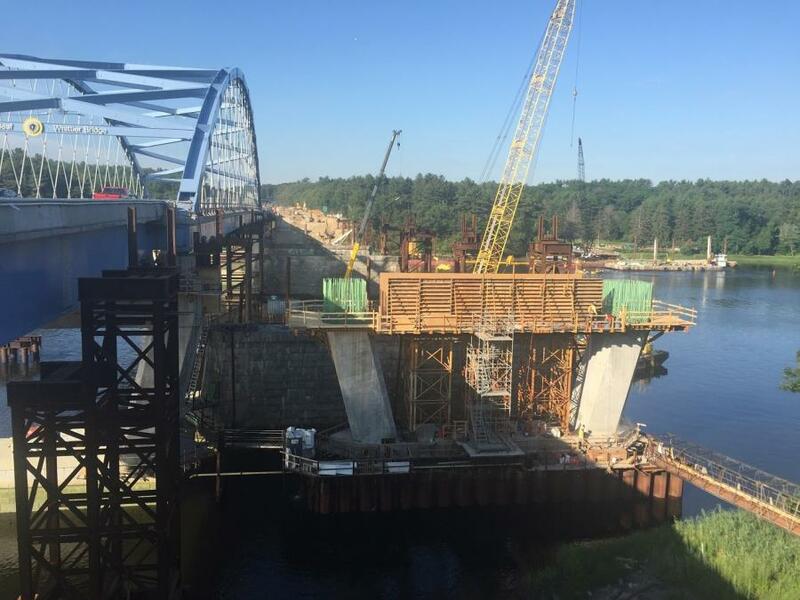 The new shared-use path being constructed on the northbound side of the Whittier Bridge also has been well received, and Monroe said that once the three access points are finished, pedestrians and bicyclists will be connected to trails on either side of the Merrimack River. New innovations on the project included a new structural coating that was developed by MassDOT Metals Control Section, along with two new concrete mixes. Daigle described one mix as being a high slump and the other a typical mix but with corrosion inhibitor additives to extend the life of the bridge; the estimated lifespan of the bridge is 75 years. The mixes for the bridge's substructure contained fly ash to help control heat stresses during curing. Expanded polystyrene blocks also were used for the first time on a Massachusetts interstate project. The reason for using the expanded polystyrene was because the underlying organic soil couldn't hold a structural load and we were up against wetlands, explained Monroe.